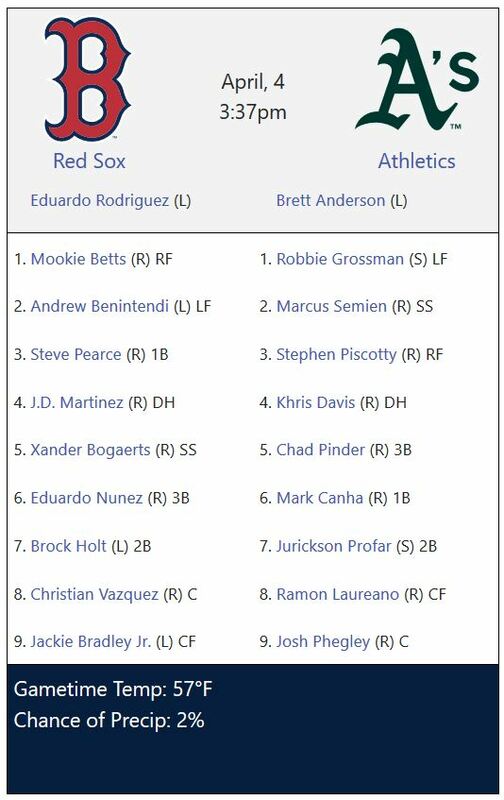 Steve pearce is back and Eduardo is on the mound. 2-0 Sox in the top of the first. I’ll take it. Another game I’m not able to watch and Gameday is boring. Be lucky you’re not watching the game. Lol. E Rod was total garbage yet again. And the offense still doesn’t seem right. Frustrating. At this point E Rod is showing me nothing at all that he can have a bounce back performance. Today’s game didn’t go the way we all wanted, but these lineup cards from baseballpress.com should be the standard around these parts. The play between Jackie and Mookie was on Jackie. CF makes the calls but I am putting 50% on Mookie based on a play earlier this year he didn’t heed JBJ calling him off.